Self's latest touch sensor switch. 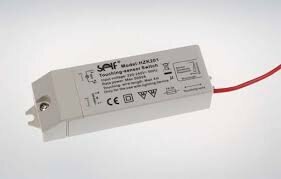 This models feature a 240v output which allows a second transformer LED / Halogen to be connected to power the relevant bulbs. There are not many touch sensor switches on the market, but these are sure to fly out the door. Once connected a simple touch will turn the light fitting on and a second touch will turn the light off.